Day 4 of Christmas Ideas week on TBA! That means tomorrow is the last day :( But there is the 25 Days of Christmas going on and I'm hosting a day next week, yay! Wow, that was a roller coaster of emotion right there lol. So today is Kid Recipe day! Continuing on with the German theme I did yesterday, here is a kid recipe for one of my FAVORITE German cookies that I associate with Christmas. 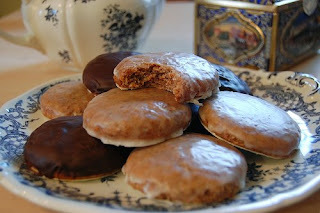 Lebkuchen! Pronounced layb-kooch-yen. The kooch part is not ch like church...it's that German-in-your-throat-that-sounds-like-you-are-coughing-up-something sound. It's kid friendly because everything is mixed in one bowl, put in one pan, then baked! Normally you don't really decorate them, but the kiddos could put on a light frosting too. I guess you could say it's German gingerbread. Grease a 15 X 10 X 1-inch baking sheet. In large mixer bowl, beat egg and oil. Add brown sugar and beat well. Add honey and molasses. Mix well. Mix together flour, pumpkin pie spice, and baking soda. Add to egg mixture and beat till well mixed. Stir in almonds and candied fruit and peel. Dough will be very thick. Spread in baking pan. Use back of spoon to spread, dipping spoon in water so that dough doesn't stick to spoon. Bake for 15 - 23 minutes or until done. with a sharp knife, score into bars immediately upon removing from oven by just cutting through the top crust. With mixer, in small bowl, beat egg white, powdered sugar and lemon juice until smooth. Spread icing over warm bars. Cool completely. Cut through completely at the score marks to cut into individual bars. This is how I know them! Those look so, so good! I'll have to make them. Thanks! Yeah :) You can do squares or circles. I'm so excited because my Oma shipped my Christmas package and in it was a bag of these!